Body: Earthwatch is an international nonprofit organization that engages people worldwide in scientific field research and education to promote the understanding and action necessary for a sustainable environment. Since 1971, Earthwatch has supported rigorous scientific research that promotes the advancement of scientific knowledge and action that addresses global change and helps sustain biodiversity. In all of these areas, we are prioritizing research that takes measurable action in addressing threats to biodiversity, ecosystem resiliency, agriculture and forestry, and human health associated with global change. Please visit http://earthwatch.org/Research-Funding/Apply-for-Funding to access detailed RFPs and our portal for submitting pre-proposals for review. The deadline for pre-proposal submissions is Sunday, June 10, 2018, 11:59 PM EDT. Juniata College, a nationally ranked liberal arts college located in the scenic mountains of central Pennsylvania, invites applications for the position of Raystown Field Station (RFS) Residence Director. The successful candidate for this position will have dual responsibilities both as a Residence Director for the college remote field station with 14 resident students and with the Raystown Field Station as an academic program assistant to support undergraduate courses and labs taught as part of the station residential semester. The Director of the Field Station and Director of Residential Life supervises this position. This position is live-in; evening and weekend hours are expected. This position is full-time with a 12-month employment term. • Assist the facilities supervisor in general station operations and visitor support. • Assist the RFS teaching faculty in classroom and laboratory exercises and provide field support logistics. • Assist in the implementation of field research projects. • Assist the Enrollment Office with scheduling new student tours. • Oversee vehicle management and scheduling. • Manage Social Media accounts for RFS. • Maintain kayaks sign out and usage schedule. • Coordinate the opening and closing procedures for the residence halls at the beginning and end of each semester and for holiday periods. • Report damages, repair needs, and replacement needs to the Field Station Office. • Develop and implement strategies that mirror the Residential Compass for students residing at the station. • Attend and monitor RFS campus functions, as needed. • Intentionally engage with outdoor student organizations and coordinate activities at the field station. • Utilize student development theories to assist with assessing student needs, setting goals, developing and evaluating programs. • When necessary, make referrals for students facing academic, personal, or other concerns. • Participate in the overall administration of the Office of Residential Life by serving on committees and tasks forces, representing the office as requested, and cooperatively assisting colleagues. • Attend one-on-one meeting with Director of Residential Life on a bi-weekly basis or as needed. • Assist the Dean of Students Office with judicial proceedings for residents who have allegedly violated a Juniata College policy. • Assume on-duty responsibilities for residents and visitors at the station. • Perform other duties that may be assigned by the Director of Residential Life. Minimum Qualifications: A Bachelor’s degree is required. Previous professional or paraprofessional experience in campus activities and/or residential life is preferred. Applicants with previous experience with environmental field science and / or outdoor education are also preferred. Juniata College takes positive steps to enhance the ethnic and gender in both its campus and its curriculum. The College commits to this policy not only because of legal obligations, but because it fully believes that such practices are basic to human dignity. that support management goals and objectives outlined in the reserve’s management plan. leave, state retirement, and health insurance. The University of South Carolina is an affirmative action, equal opportunity employer. Battelle is guided by a founding mission. We invest our knowledge, talents and resources, helping our customers achieve their most important goals. We apply scientific rigor and creativity, succeeding where others may fail and we invest in our communities, making the world better for generations to come. All of us share a common purpose: to solve the greatest challenges of today and tomorrow. The National Ecological Observatory Network (NEON) Program is currently seeking a Field Operations Manager. This position is located in Hilo, HI and manages NEON operations at Pu'u Maka'ala Natural Area Reserve.. Occasional travel outside the region will be required. NEON is a continental-scale ecological observation facility sponsored by the National Science Foundation that gathers and synthesizes data on the impacts of climate change, land use change and invasive species on natural resources and biodiversity. The observatory is designed to collect high-quality, standardized data from field sites across the continental United States, Alaska, Hawaii and Puerto Rico. This position manages a broad scope of scientific inquiry, managing a multi-disciplinary team of field scientists who collect measurements related to botany, invertebrates, soils, micrometeorology, and eddy flux at one NEON site in Domain 20 - Hawaii (Pacific Tropical). Plan, schedule, conduct and ensure accurate execution, within NEON scientific parameters and annual budget, of all maintenance, repair and field sampling activities for 1 NEON field site. Coordination for instrument maintenance is required for approximately 40 different sensors, data acquisition system, power distribution system and supporting infrastructure (i.e. tower, instrument hut, boardwalks). Coordination for field observations and collection are conducted using approximately 15 different protocols and multiple SOP’s with varying schedule requirements based on local ecosystem and current field conditions. Recruit, train and manage all regular and temporary personnel supporting field office, lab and field site tasks. Act as liaison between regional stakeholders, including educational and research organizations, local property owners and the general public and NEON Headquarters. Communicate NEON status and activities, local activities and partnerships, and regional issues and concerns to appropriate regional stakeholders and NEON staff. Work with regional stakeholders to resolve issues or concerns. Plan and participate in local/regional community engagement activities (i.e. 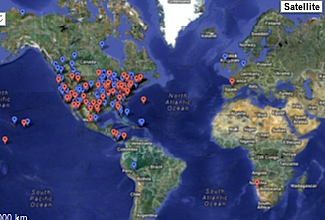 local/regional conferences or meetings, invited talks). Ensure compliance with NEON safety policy and procedures. Ensure appropriate equipment, materials and supplies are available to support required field activities. Ensure accuracy and efficient use of funds within assigned region. Bachelors’ Degree in life science field. 5 years previous experience supervising personnel including participating in hiring, training, and evaluating performance. Previous experience developing and managing budgets and schedules. Previous experience performing ecology related lab and field activities and/or maintaining scientific instrumentation (e.g. meteorological and aquatic sensors). Previous experience communicating with external stakeholders such as customers, funding agencies, regulatory agencies, etc. Requires critical human relation skills to understand, select, develop and motivate others. Previous experience managing a technical field operations group. Graduate study in biology, ecology, environmental science or related field. Previous experience leading or participating in outdoor activities in remote areas. The Toolik Field Station (TFS) Facility Supervisor manages many aspects of on-site operations at Toolik Field Station including supervising up to 20 staff members and providing high-level service to a wide variety of users of the station. This position splits time in residence on site at the station and at the administrative offices on the University of Alaska Fairbanks campus. The Toolik Field Station, a unit of the Institute of Arctic Biology, University of Alaska Fairbanks is a world-renowned Arctic field station located 360 road miles north of Fairbanks, Alaska on the rural Dalton Highway. The remote station supports researchers, students, and others from around the world. The population of the station can vary from 3 to 150 residents throughout the year (over 400 different individuals annually) and is open 365 days a year. The ideal candidate has experience in remote operations, leadership, supervising multiple staff, and professional and high-level customer service.